West Clermont School District Superintendent Natasha Adams has started a blog. She plans to discuss a variety of timely issues and provide information to district students, staff, parents, business partners and community members. The Fall Festival is almost here. There will be a bid and buy and a pumpkin decorating contest. Click below for more information. Wristbands are also available to purchase in advance. Buying ahead is the more cost effective option. Click below for order form. 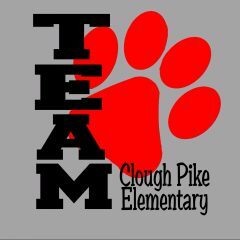 Please consider donating to the Clough Pike Elementary FUNd-a-thon. It is a day filled with lots of fun, games, walking and raising money for Clough Pike Elementary. This is our biggest fundraiser of the year. If you aren’t sure what the PTO does to support the school, read the PDF below. Like what you see and want to contribute? The Spirit Spot is back again this year. We are always seeking volunteers for many events during the school year. See below for more information. The Clough Pike Elementary PTO has several events and meetings throughout the year. See below for calendar. We are now taking orders for school spirit wear. See attached form for items and pricing. Welcome to the Clough Pike PTO. We are an organization dedicated to supporting the education of students at Clough Pike Elementary by fostering relationships among the school, parents and teachers. Click for membership form.